International Relations Office and Scientific Department inform about the development of a new Internet resource for the registration of TSTU professors interested in attracting foreign young researchers, master and post-graduate students in the framework of international scholarship programs. The Russian scientists’ database is formed on the platform stipot.com to attract young researchers to Russian scientific and educational organizations through scholarships and grants. The information provided will be available to young people who plan to receive grants for scientific mobility, to search for a supervisor in Russia, to receive an invitation and further training and research in Russian scientific and educational organizations. The Ministry of Science and Higher Education of the Russian Federation recommends the heads of research groups, collective use centers and laboratories interested in attracting foreign students and scientists to register on this platform. On March 12, 2019 in the framework of Cooperation Agreement with Belarusian State Agrarian Technical University at TSTU Department of "Agricultural engineering" the leading specialist of the Belarus University in the field of agricultural machinery operation, Associate Professor Tatiana Neparko read an online lecture. During the lecture, methodology and mathematical models for the selection of rational complexes of machines were presented, as well as the ways of distributing the volume of work using machine-tractor units and examples from the practice of agricultural enterprises. Students of the Institute of Architecture, Civil Engineering and Transport of Tambov State Technical University carried out their internship in Florence (Italy) in the period of February 28 - March 9,2019. The main purpose of their visit was the acquaintance with modern urban technologies, in particular, the so – called "slow" movement (Slow Life, Cittaslow) - one of the tactics in implementation of the strategy of territories sustainable development. As part of the internship, students also participated in the 21st International Assembly and Symposium of the Romualdo del Bianco Foundation "Heritage as a Builder of Peace". TSTU representatives participated in the 21st General Assembly and Symposium "HERITAGE as a BUILDER of PEACE"
Every year in March representatives of Tambov State Technical University visit Florence to take part in events organized by Romualdo Del Bianco Foundation - the General Assembly and the Symposium "Heritage for Earth planet", "Heritage as a Builder of Peace" and "Life Beyond Tourism”. At the plenary session of the Assembly "Management of Cultural Heritage" the report was made by the Vice-rector for international activities of TSTU Elena Mishchenko. She presented the best practices of interaction between TSTU and the Tambov region for preservation of cultural traditions, crafts and monuments of architecture. As part of this event, a new cooperation agreement was signed between Tambov State Technical University and the Romualdo Del Bianco Foundation. The ideas of further cooperation with the Foundation were discussed with the administration of this organization. On February 28 - March 2, 2019 the VIII International Conference "Market Economy: Today and Tomorrow" was held at the Belarusian State Agrarian Technical University in Minsk. The conference was attended by students from higher educational institutions of Belarus, Kazakhstan, Ukraine, Azerbaijan, Russia, Turkmenistan, Nigeria, South Africa and other countries. Among the participants there were students of Tambov State Technical University. TSTU Russian language center, established on the Russian language faculty of the Institute of Applied Science and Technology of Hainan University (China) is successfully working to promote the Russian language and culture. On March 9, 2019 Chinese students got acquainted with the Pancake week - one of the most cheerful and bright ancient Russian holidays. Russian language teachers gave Chinese students the task to prepare colorful presentations about the history of the holiday, its importance and the way the Russian people spend the pancake week. At the end of the event the students enjoyed traditional pancakes. On March 6, 2019 Tambov State Technical University held Pancake Week festivities. Students took part in funny contests, ate pancakes and watched the fire show, which ended with a spectacular burning of the stuffed figure of winter. Students from different countries - China, Syria, Iraq, Gabon, Zimbabwe, Equatorial Guinea, Egypt, Indonesia and many others took part in the traditional holiday of TSTU. On March 6, 2019 at the Russian language faculty of the Institute of Applied Science and Technology of Hainan University on the eve of International Women's Day a competition for girls was organized and conducted by the teacher of TSTU Varvara Vukolova, currently working at the faculty of the Institute. Before the competition, the guys congratulated their fellow students on the International Women's Day: they read poems in Russian and Chinese, sang songs, and then gave all the girls sweet gifts. The purpose of this event was to develop creative abilities and cognitive activity of students. On February 28, 2019 Tambov State Technical University organized a meeting of the International Women's Club. Students of the Faculty of International Education, pupils of the Tambov lyceum ?6 were able to communicate in the format of the round table. The event was organized on the eve of International Women's Day. TSTU students from Syria, Egypt, Iraq, China, Cameroon and other countries and Tambov schoolgirls talked about fashion, cosmetics, cooking, beauty and self-care, various hobbies. The girls could exchange recipes of national dishes, discuss fashion trends in different countries of the world. Foreign students of Tambov State Technical University took part in the opening of Japanese movies festival "Momiji"
On February 15, 2019 in the Tambov regional Museum of Local Lore in the framework of the Cross Years of Russia and Japan with the support of Tambov regional branch of the Russian-Japanese Society the festival of Japanese movies "Momiji" was opened. Foreign students of the Faculty of International Education of TSTU were invited to the festival. They got acquainted with Japanese movies and culture. Together with the teachers of the Department "Russian Philology" students discussed the plot of the film and shared their impressions in Russian. In the framework of academic mobility programs Professor of Maltepe University (Istanbul, Turkey) Irina Shelenkova visited Tambov State Technical University. She held a seminar for TSTU students "International Academic Mobility as One of the Priorities of Multicultural Education", during which the opportunities for participation of Russian students in educational and scientific exchange programs were presented. On January 15-19, 2019 Polytechnic University of Porto (Portugal) held a coordination meeting in the framework of the ERASMUS +project "Engineering Educators Pedagogical Training" ENTER, one of the key participants of which is Tambov State Technical University. TSTU was represented by Vice-Rector for International Activities Elena Mishchenko and Head of International Relations Office Larisa Mikheeva. The purpose of this project is the development and implementation of a new multicultural and international approach to formal postgraduate professional and pedagogical education for teachers of engineering disciplines. A delegation of Iraq representatives visited Tambov State Technical University. These are the heads of the University of Technology and Imam Kadhim University. The guests got acquainted with the structure, directions and specialties of TSTU, visited scientific laboratories, departments and research centers, met with Iraq students studying at TSTU, discussed the prospects of cooperation of universities with TSTU administration. At the end of the visit TSTU, Iraq University of Technology and Imam Kadhim University signed the cooperation agreements. Rector of TSTU Mikhail Krasnyanskiy and Vice-rector for international activities Elena Mishchenko took part in the conference "Sustainable Cross-Border Cooperation in Education and Applied Research", organized by the Bavarian competence centre of Central and Eastern Europe and the Eastern Bavarian Technical University Amberg-Weiden in Germany. TSTU has been cooperating with Amberg-Weiden University for 4 years and is a permanent partner of this University in the scientific, educational, social sphere. The universities agreed to develop scientific and educational cooperation in the field of digitalization of energy and other areas of activity. Cooperation between TSTU and Tashkent Chemical-Technological Institute started in the framework of the first Russian-Uzbek educational forum "New Personnel-for the New Economy". As a result of the partnership within the framework of this forum, the rector of TSTU Mikhail Krasnyanskiy signed an agreement on cooperation between Tambov State Technical University and Tashkent Chemical-Technological Institute. The first common activity was a series of lectures given by the staff of TSTU to students of Tashkent Chemical-Technological Institute. Classes were held online. Faculty of Russian language of Hainan University held an open event dedicated to the promotion of the XXIX World Winter Universiade 2019. The purpose of this event was to acquaint students with the history of the Universiade, to form a positive attitude to it and to cause a wish to be engaged in favorite sports, to lead a healthy lifestyle. 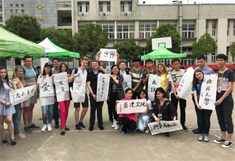 The event was organized and conducted by Candidate of Phil.Sci., the teacher of TSTU Department "Russian Philology" Varvara Vukolova who now works in Hainan University. TSTU Foreign students celebrated the day of the letter «Ё"
Students of the Faculty of International Education celebrated an unusual holiday-the day of the letter "Ё". The day of the letter "Ё" is celebrated in Russia on November 29. This holiday was established not so long ago in order to prevent discrimination of this symbol of the Russian alphabet. The teachers of the Faculty of International Education arranged an interactive quiz for foreign students who study Russian at TSTU. The winners received memorable prizes. On November, 22 the students’ photo exhibition "Maple Season in Russia-Momiji in Japan" was opened in TSTU. This exhibition was organized in the framework of the Cross Years of Japan and Russia 2018 and implementation of activities of the strategic project "International EcoGreen Center" of TSTU. Students submitted more than 100 works in several categories. The students 'photos were evaluated by a competent jury. TSTU Professor of "Physics" Department, Dr. of ph. and math. Sc. Roman Morgunov and leading researcher of the same department, Dr. of ph. and math. Sc. Oksana Koplak won the Von Humbolt Grant to deliver lectures and conduct research in the University of Duisburg-Essen (Germany). TSTU greeted guests from Uzbekistan universities: Nortoji Khuzhamshukurov, Dean of the faculty of Tashkent ?hemical-Technological Institute and Abdukhalil Ganiev, head of the Department "Information Security" of Tashkent University of information Technologies. In the frames of the visit to Tambov State Technical University the Uzbekistan representatives got acquainted with educational process, research results, opportunities of unique equipment in TSTU centers of shared access. On November 14-16 V International scientific and practical conference "Virtual Simulation, Prototyping and Industrial Design" was held in Tambov State Technical University. The conference was attended by representatives of foreign universities and companies. The aim of the conference was to discuss and publish the research achievements of scientists, as well as to identify and discuss possible solutions to the problems of methods and algorithms development for creation and application of virtual models and prototypes of different objects. TSTU Russian Language Center, organized at the faculty of Russian language of Hainan University carried out the open lesson "Let's get acquainted", where Chinese students got the first information about the Tambov City and Tambov State Technical University. The event was organized by the teacher of TSTU Department "Russian Philology" Varvara Vukolova. At the moment, she works at the Russian language Center of Hainan University in the framework of the cooperation agreement between universities to promote Russian language programs. Chinese students learned about the history of Tambov, its geographical location, economy, theaters and museums, galleries, architecture and historical attractions. On November 6-9 Tambov State Technical University held the XI International Thermophysical School "Information-Sensor Systems in Thermophysical Research". 35 Russian universities from 24 Russian cities and representatives of more than 20 universities from Italy, Spain, Germany, Singapore, Greece, Japan, Poland, Bulgaria, Belarus, Tajikistan participated in the international thermophysical school. Within the framework of this conference, scientists discussed fundamental and applied problems of heat and mass transfer, new energy-saving technologies, materials, fuel and non-traditional energy sources, new methods and information-sensor systems for research and measurement, economic problems of energy saving, automation of thermal control methods and others. TSTU students attended the workshop "Cross-Сultural Сommunication of Russia and Japan"
On October, 18 at the Tambov Youth Theater a Japanese actor Katsura Utazo presented a solo performance in the genre of "rakugo" (traditional literary and conversational genre that originated in Japan in the XVI-XVII centuries) in the framework of the Cross Years of Russia and Japan supported by the "Tambov affiliate of Russian - Japanese Society". TSTU students were invited to this performance. They had the opportunity to get acquainted with the peculiarities of Japanese theater culture and communicate with the Japanese master. A delegation from Iraq universities and public administration visited Tambov State Technical University. Representatives of the administration and professors from the Universities of Baghdad, Basra, Muthanna and Kufa, the Iraq Ministry of Agriculture and Ministry of Commerce visited TSTU in the framework of the Ist International scientific and practical conference "Digitalization of agro-industrial complex" and the VIII International Pokrov Fair. The Iraq delegation also attended retraining course "Technologies of Modern Management" including modules on time management, Internet marketing, managerial decision-making methods taking into account characteristics of cross-cultural management delivered by TSTU professors. TSTU students and teachers took part in the International summer school "Energy Efficiency and Energy Saving as Factors of Regions Sustainable Development" at the National Polytechnic University of Armenia (Yerevan). The training was aimed at forming students' understanding of the need to include energy factors in the system of regional development. Special attention was paid to energy efficiency indicators. An important component of the training was a visit to the training center of aviation/air robotics, national engineering laboratories of Armenia and enterprises producing solar batteries. In October the Ural Federal University named after B.N. Yeltsin held an international conference on dissemination the results of the MARUEEB project "Master Degree in Innovative Technologies in Energy Efficient Buildings for Russian and Armenian Universities and Stakeholders" - ERASMUS+ program. Within the framework of this event, the consortium member universities from Russia, Armenia, Italy, Slovakia, Romania and Lithuania presented scientific and educational results achieved during the project implementation. TSTU hosted the Ist International scientific and practical conference "Digitalization of agro-industrial complex"
In October 10-12 Tambov State Technical University held the international scientific and practical conference "Digitalization of Agroindustrial Complex." This is a landmark event for the region, which was organized with support of the Regional Administration within the framework of one of the priorities of the Russian President Vladimir Putin and the Governor of the Tambov region Alexander Nikitin – the creation of a digital platform for agriculture. It was attended by the representatives of universities, research organizations, IT and agribusiness companies from the Tambov region and other regions of Russia, as well as foreign representatives (Italy, Spain, Germany, Lithuania, Kazakhstan, Armenia). In September, the University of Cardiff (UK) hosted the 12th ECCRIA Conference (The European Conference on Fuel and Energy Research), organized by the Forum on fuel and energy research. It was attended by the post-graduate student of TSTU Natalia Muratova. She made a presentation on the topic "On issue of a number of problems solving at utilization of poultry manure as biofuel". The advisor of the Foundation Romualdo del Bianco Ghislaine Avan visited TSTU in the period September 07-12. She develops her project for the preservation of cultural heritage and invited TSTU students to take part in it. Ghislaine Avan travels around the world and makes videos in which people of different nationalities read extracts from The Divine Comedy by Dante Alighieri in their native languages. Videos are recorded in the most significant places of the world culture and history. The project has been implemented since 2007. On September 7, students, schoolchildren, teachers, representatives of environmental organizations gathered in TSTU to discuss environmental problems and offer their solution. The platform for discussion was International Youth Educational Forum "EcoGreen" ("Ecological Global Regional Initiatives") organized by the University. The forum was attended by students and pupils of Tambov and the Tambov region, group of students and a teacher from Bialystok University of Technology (Poland), as well as the representative of the Foundation Romualdo del Bianco (Italy) Chislaine Avan. The Education, Audiovisual and Culture Executive Agency of the European Commission announced the results of the ERASMUS + 2018 project competition. TSTU received a grant for the project "Engineering Educators Pedagogical Training" / ENTER (598506-EPP-1-2018-1-PT-EPPKA2-CBHE-JP). The aim of the project is to improve technical universities teaching staff skills based on international network cooperation, implementation of modern technologies, as well as the development of a multi - level modular system of pedagogical retraining. The project consortium includes universities and associations of Russia, Portugal, Slovakia, Latvia and Kazakhstan. The project coordinator is the University of Porto. The duration of the project is 3 years. On July 31, a teleconference was held between the administrations of Tambov State Technical University and Alassane Ouattara University in Bouake (Cote D'Ivoire). The parties discussed the plan for cooperation within the framework of the agreement signed earlier. During the discussion, the universities expressed mutual interest in implementation of joint Master's training programs, on the results of which the students will get double diplomas in the field of biomedical engineering, business informatics, economics and law. Director of Center of shared access "BIM Technologies" of Institute of Architecture, Civil Engineering and Transport Sergey Strulev took part in International Forum at Bialystok University of Technology. Participants of the event were the representatives of teaching and administrative staff of universities from 21 countries including South and Central America, Africa, Asia, Oceania and Europe. International Forum was aimed at the development of cooperation between universities in educational and scientific fields. Foreign teachers organized short training courses at all main faculties of the University. Sergey Strulev gave a short course of lectures in English "Modern information technologies in construction" for undergraduates of training direction "Construction of Roads". Students and teachers of Tambov State Technical University were trained at Wuhan Polytechnic University in the framework of Summer school "Economic Development of China on the example of Hubei Province". The training program included classes on economics, architecture, construction, as well as cultural activities. TSTU students and teachers took part in the international summer school "Environmental Problems: EU and Russia", held at the University of Genoa in Italy. The training was aimed at the formation of students' understanding of the current environmental situation, taking into account their study direction in TSTU. Lectures and practicals included the discussion of issues related to renewable energy sources, environmental policy, the relationship between business and the environment. Ten students of Institute of Power Engineering, Tool Engineering and Radio Electronics; Technological Institute, Institute of Economics and Quality of Life; Institute of Automation and Information Technologies within the framework of academic mobility program passed a short-term internship at the partner University of TSTU- East Bavarian Technical University of Apllied Sciences Amberg-Weiden in Germany on the program "Maintenance of Buildings with Decentralized Power Supply". The internship program included the implementation of the engineering and design project together with the students of the German University, visits to large industrial enterprises of Bavaria, acquaintance with the production processes and management structure. Strobel Quarzsand company offered students to participate in an experiment on the creation of concrete samples with different strength parameters. Students also got acquainted with the system of energy and water supply, water disposal and water purification of the city pool, the project of which was developed with the participation of scientists of the East Bavarian Technical University. In the period May 4-11, 2018 TSTU students and staff took part in the memorial event to commemorate the victims of the Second World War in Genoa. At the end of the event the students of TSTU together with other participants were invited to the Consulate of Russia for an action, dedicated to the memorable date. A group of students from Tambov State Technical University arrived in Germany to take part in the international summer school "Maintenance of Buildings with Decentralized Power Supply". On May 9, the students joined the "Immortal regiment" in Munich. From Munich they went to the city of Weiden, where the East Bavarian Technical University of Applied Sciences held a summer school. On the victory Day May 9, 2018 TSTU students were in China to participate in the educational school "Economic Development of China on the Example of Hubei Province". The students and teachers joined "Immortal Regiment" action, which was held in Wuhan in the Liberation Park, where the memorial complex dedicated to the fallen Soviet volunteer pilots is located. Associate Professor of the Institute of Environmental Engineering of Kaunas University of Technology (Lithuania) Irina Kliopova visited Tambov State Technical University. During her stay in Tambov Irina Kliopova held a series of meetings with students and teachers of the University and delivered lectures for students of the Institute of Architecture, Civil Engineering and Transport in the framework of ERASMUS + project "Master Degree in Innovative Technologies in Energy Efficient Buildings for Russian and Armenian Universities and Stakeholders" MARUEEB. In the middle of March the University of Genoa (Italy) hosted the international conference "Energy Efficient Building in the Smart City. Technology, Economy, Entrepreneurship". TSTU employees - Vice-Rector for International Activities Elena S. Mischenko and senior lecturers of the Department "Construction of Buildings and Structures" Alexander and Semyon Mamontov took an active part in it. Together with colleagues from the universities of Voronezh, Yekaterinburg and Chelyabinsk, teachers of the Department "Construction of Buildings and Structures" prepared and presented a report on the development of smart technologies in Russian cities, including Tambov. On February 14, a unique training laboratory в__Energy Efficiency in Constructionв__ was opened in Tambov State Technical University. This laboratory was equipped within the framework of the international ERASMUS + project "Master Degree in Innovative Technologies in Energy Efficient Buildings for Russian and Armenian Universities and Stakeholdersв_" "MARUEEB". The ceremony was attended by Professor of Genoa University (Italy) Vincenzo Bianco, he was honored to personally cut the red ribbon, opening the way to a new laboratory. On February 26, Tambov State Technical University hosted the International Youth Forum on energy efficiency and energy saving in urban environment, which was attended by representatives of universities of Tambov, Voronezh, Kazakhstan and Slovakia. Students and young researchers discussed the rational use of energy resources, the reduced consumption of energy to ensure the functioning of buildings, technological processes in production and construction of facilities. On January 12 Tambov State Technical University held a press-conference of TSTU students with journalist from Germany. Holm Inglericht Kerstin was a correspondent for The Frankfurter Allgemeine вЂ" one of the largest and most influential German newspapers in Russia, for more than 20 years. The participants were the students with an active lifestyle, who achieved certain success in study, young scientists and volunteers. Kerstin Holm got the interest in scientific development and creative activities of the University. In January, representatives of Tambov State Technical University visited the University in Wuhan (China). In the framework of the visit TSTU and Wuhan University of Technology signed the cooperation agreement. In the course of the agreement it is planned to implement joint research projects, scientific seminars, joint educational activities, organization of conferences and interaction between research groups of the universities. The TSTU students took part in the international seminar on effective business communication "Japanese Hospitality as a Way to the Client's Heart"
On November 16, 2017 the specialist in business etiquette and hospitality Takemoto Kuniko held a seminar "Japanese Hospitality as a Way to the Client's Heart". The seminar program covered issues of business etiquette and communication, hospitality industry, the features of the reception of guests and partners from Japan. The seminar was organized with the support of the Tambov Regional Branch of the Russia-Japan Society. Students and teachers of Tambov State Technical University took part in Bavarian - Russian conference on economic sciences which took place on November 9-10, 2017 at Friedrich Alexander University in Erlangen and Nurnberg. This conference should serve to strengthen the links between the Bavarian and Russian universities, to promote the exchange of professional experience, as well as accumulate new ideas for cooperation in research and training. Special attention was given to stimulating the organization of new joint projects in the field of empirical research. The conference program included a substantive section on economics, management and energy economics. On October 27, 2017 Tambov State Technical University organized a meeting in the framework of The Nobel Congress: The 11th International Meeting-Conference of Nobel Prize Winners and Nobelists "Science, Technology, Society and International Nobel Movement", dedicated to anniversaries of remarkable Nobel inventions and International Information Nobel Center. The Congress was presented by the following members: Nobel's grandnephew Michael Nobel, scientists from Russia, Austria, Israel, Azerbaijan, Kazakhstan, Miss Sweeden-2015. TSTU was represented by the Rector Michail N. Krasnyansky, the Vice-rectors N.V. Molotkova, D.Yu. Muromtsev, A.V. Maistrenko. E.S. Mischenko and other reperesentatives of TSTU administration, as well as TSTU students: Miss Tambov -2015 V. Maksimova and Miss TSTU-2017 S. Savelieva. On October 22-25, 2017 North Ossetian State University held the International Student Conference in ecology with more than 300 participants. Conference program covered a wide range of topics from biological methods to economic analysis. TSTU students could also get acquainted with the sights and nature of South Russia. TSTU signed an agreement on cooperation with Latvian university. Tambov State Technical University held a meeting with representatives of the Rezekne Academy of Technologies (Latvia). Constructive conversation ended up with the signing of the Cooperation agreement between Tambov State Technical University represented by the rector of TSTU Mikhail N. Krasnyansky and Rezekne Academy of Technologies and its rector Edmunds Teirumnieks. The subject of the agreement is the promotion of educational and research opportunities of students and teaching staff of the parties and provision of opportunities for cultural exchange between higher educational institutions, implementation of joint academic, research and other projects, publication of scientific and methodical works (articles and presentations). On October 11, 2017 the Rector of TSTU Mikhail N. Krasnyansky and the President of the University of Lorraine, prof. Pierre Mutzhenhard signed a memorandum of cooperation in the field of science, education, academic mobility, development of joint projects. University of Lorraine opened new European horizons for TSTU to develop scientific relations and cooperate with the world's best specialists in spintronics. On October 4, 2017 Tambov State Technical University held the international student conference "Training of IT Professionals to Digital Economy". The participants of the conference were represented by foreign students-undergraduates, graduate students and teachers of TSTU as well as the Danish entrepreneur Jens Rasmussen, who founded his agricultural enterprise in Tambov region. The participants of the conference discussed such issues as "the Use of IT Technologies in Teaching Academic Writing", "Digital Economy in Commercial Organizations Activities", "Language as a Tool to Build Digital Economy" and others. The reports were presented in Russian and English. On September 17-22, 2017 Peter the Great St. Petersburg Polytechnic University hosted an international conference in the framework of the project ERASMUS+ MARUEEB "Master Degree in Innovative Technologies in Energy Efficient Buildings for Russian and Armenian Universities and Stakeholders" where representatives of TSTU summed up the interim results of the project. TSTU implements MARUEEB project in cooperation with 5 European universities from Italy, Slovakia, Lithuania and Romania as well as with the Russian universities. The main objective of the project is to develop a joint master program "INNOVATIVE TECHNOLOGIES IN ENERGY EFFICIENT BUILDINGS" in the Armenian and Russian universities. On September 11-17, 2017 the group of 7 students of Institute of Architecture, Civil Engineering and Transport supervised by the assistant professor of the Chair "Town Planning and Roads" O.N. Kozhukhina were trained in the field of construction at Bialystok University of Technology. The event was organized in the framework of agreement on cooperation between Tambov State Technical University and Bialystok University of Technology (Poland). The group of students from Bialystok University of Technology arrived to Tambov State Technical University in the framework of the realization of student exchange program between TSTU and BTU. Acquaintance with Tambov architecture was a part of their visit. The students were shown one of the largest and newest sports facilities in the region - the Marital Arts Center. They are the future specialists in construction, therefore their interest to visit the Center was not sports. Together with the teachers they walked through the Center, focusing on the structural elements of the building.